Wilderness Rescue: On Sept. 5 at 5:10 p.m. DEC Ray Brook Dispatch received a radio call from John’s Brook Loj requesting assistance for a 27-year-old man from Montreal, Quebec, with a shoulder injury. Under Lt. Brian Dubay’s authority, one caretaker and one Ranger were dispatched to assist the subject. The John’s Brook Caretaker responded to the Loj and assessed the subject. The shoulder was splinted and the man was able walk out. Ranger Robbi Mecus met up with the John’s Brook Caretaker and the subject at 7:58 p.m. The man was escorted the rest of the way out to the Garden parking lot. Once at the parking lot, the man advised he would seek medical attention on his own. Wilderness Search: At 6:45 p.m. on Sept. 8, a call came into DEC Ray Brook Dispatch reporting two missing rock climbers on Wallface Mountain. Under the authority of Lt. John Solan, three Rangers were requested to respond to the Upper Works Trailhead to locate the vehicle and start searches along the Indian Pass Trail. At 11:01 p.m., Rangers were in contact with one climber, a 40-year-old woman who walked herself out to the trailhead to meet the reporting party. She had become separated from her partner, a 33-year-old man from New Paltz, while descending the trail off the cliffs. As additional Rangers began search efforts the following morning, the man was located along the Indian Pass Trail about a half-mile from the Henderson Lean-to. He was found to be in good shape and was escorted out to the trailhead by Forest Rangers. Wilderness Rescue: On Sept. 9, at 1:29 p.m. DEC Ray Brook Dispatch received a request for assistance from Adirondack Mountain Reserve for a 28-year-old woman with an ankle injury on the Indian Head Trail. 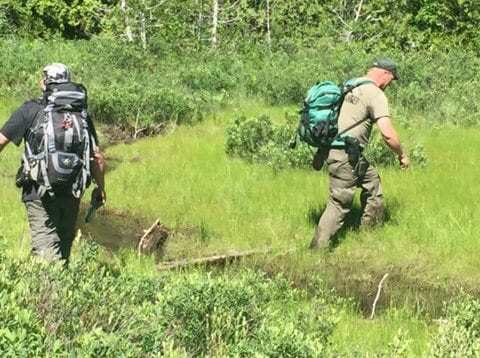 Under Lt. Gary Friedrich’s authority, Ranger Robbi Mecus and an assistant Ranger were dispatched to assist the hiker from Gatenau, Quebec. Keene Valley Fire and Rescue also responded along with three volunteer climbers. Once on scene, Ranger Mecus assisted in splinting the woman’s ankle and she walked out to the Lake Road, where a waiting Keene Valley Ambulance was staged. After she was evaluated, she declined any additional medical attention and the incident concluded at 3:30 p.m.
Be sure to properly prepare and plan before entering the backcountry. Visit DEC’s Hiking Safety and Adirondack Backcountry Information webpage for more information.